If you need to create a video of what happens on your computer screen, such as for a demonstration or tutorial, an excellent program to use is Camtasia Studio ($300, 30-day free trial) from TechSmith. TechSmith, as a company, has been around a long time in computer-years. Their focus has always been on utilities for recording, sharing, and using what's displayed on your computer screen. 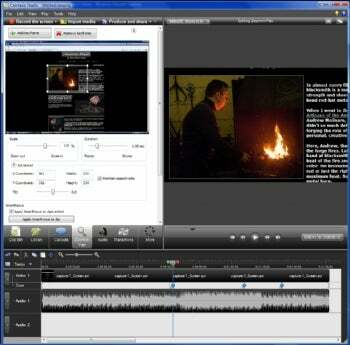 With version 7.0, Camtasia Studio has streamlined editing and added some slick options. With Camtasia Studio's SmartFocus, you can have automatically created, fully customizable keyframes that will zoom into the area of your screen where your cursor clicks or you input keystrokes. It's easy to set up and record anything on your screen. While you download the program, TechSmith sends you an e-mail with links to online tutorials, which we found to be very helpful and simple to follow. There's even an included PowerPoint plug-in for recording your presentations. And you can add other digital files to your video, including AVI, MPEG, MPG and WMV. Another addition in 7.0 is the ability to save your assets in the Library to share with others, which helps with maintaining a consistent brand. All you do is copy and paste assets, such as titles or sequences, into a timeline to use them in a new video. With Camtasia Studio, you don't need highly tuned video editing skills to produce a nice-looking video of any kind of screen-based activities. But, with all the options it offers, a really sleek video will require some production time.